When the catalogue was sold originally it came with a large (40"x50") colour map of Crystal Palace Park. As it would cost considerably more than £5 to reproduce the map as a full size colour copy, we are exclusively making it available as an A3 size colour copy. The year 1911 was both a very good and a very bad year for the Crystal Palace. The Coronation of King George V and the Festival of Empire were the highlights, but were followed by the bankruptcy of the Crystal Palace Company. Knight Frank and Rutley, auctioners were commissioned by the High Court to sell the building, contents and grounds. The auctioneers produced what, even in 1911, was considered a sales catalogue without equal. Long before the actual auction announcement however, Mr (later Sir) Howard Frank, with his flair for public relations, was mobilising public opinion. There were at least two editions of the sales brochure produced which was lavish even for a Coronation Year production, and a work of art in every sense. It was produced by the Manager of the auctioneers London office Cecil W. Ingram, a past-master at sales brochures such as this. Its generous layout and typography were years in advance of its day. Printed on hand-woven paper by Hudson & Kearns, London, SE, it contained fifty-two pages of photographs and engravings and sixty-four pages of text, running to more than 20,000 words. It weighed approximately 3lb, without the loose map, envelope and substantial cardboard case, and its size was a large – 16½in by 11in. The company sold copies for £1.1s (about £51.20p today) and some subscribers bought as many as 20 copies. The Times reported on 3 December 1936 that ‘an offer of £5.5s (about £165.95p today) had recently been refused for a single copy’. For the first time ever reproduction copies are now available exclusively from us. 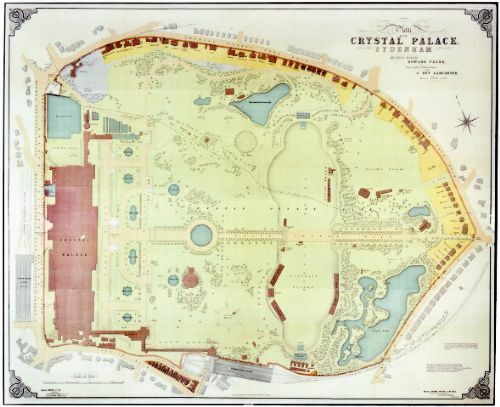 The map shows a wealth of the most intimate detail about the Crystal Palace building and grounds found anywhere. This map will not be available in shops. The map was originally sold with a detailed catalogue.